Here in the United States (I’m having a lot of traffic today from Eastern Europe), we celebrate our Thanksgiving on the third thursday in November. Well, tomorrow is the big day where we stuff our faces with the most heavy, butter laden foods known to man and amazingly enough we don’t feel sorry for it. Traditionally the meal consists of a turkey with lots of side dishes, and my favorite part…the DESSERT! I usually make pumpkin pie, but this year I’m going out on a limb and trying a southern classic…pecan pie? No, Sweet Potato Pie. I googled a recipe, and as you know when you do something like that you get thousands. 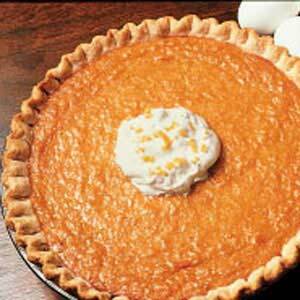 Everyone has their own spin on this type of pie, and a lot of them had corn syrup as an ingredient. Now, I don’t care if the recipe has been passed down from your great great great granny, I doubt she used corn syrup, and I personally don’t want to eat it. So, after a diligent search, I found a recipe that I will use tomorrow for my pie. In a bowl, cream butter and sugar. Add eggs; mix well. Add milk, sweet potatoes, vanilla, cinnamon, nutmeg and salt; mix well. Pour into pie shell. Bake at 425° for 15 minutes. Reduce heat to 350°; bake 35-40 minutes longer or until a knife inserted near the center comes out clean. Cool. Store in refrigerator. Yield: 6-8 servings. Nutritional Facts1 serving (1 slice) equals 372 calories, 18 g fat (9 g saturated fat), 86 mg cholesterol, 300 mg sodium, 48 g carbohydrate, 2 g fiber, 6 g protein. I added the nutritional content from the recipe, but don’t pay attention to those facts, your mouth will be rejoicing with the flavor!